Discussion in 'General' started by Cooperkill, Apr 30, 2018. This weekend I met Scout Taylor-Compton at Chiller Theatre. She signed a poster using dark blue ink on a black background, which was my fault. The guy I paid asked what color I wanted, and I thought the blue would be more vibrant. It isn't. You can hardly see her signature. My question is this? Do you think going over her signature in silver would ruin the validity of her autograph? I have dozens of autographs and never ran into this problem before. 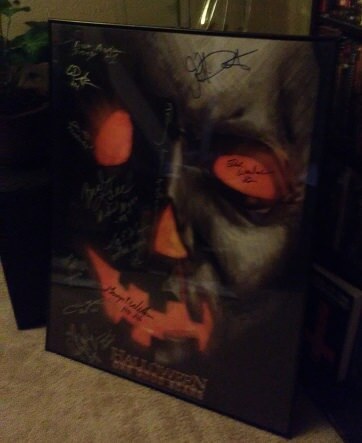 Maybe I should get a frame light and hang it from the bottom, since the sig can be seen in direct light, as pictured. Maybe I'm overthinking this. I would probably leave it alone. Personally I think going over her signature in silver would take away from it. baggio, ImmortalSlasher, rxfiend and 2 others like this. Agree. Leave it as is. Yeah, I'll probably leave it as is and buy a light. I once had a friend make a change on a poster. Thom Matthews spelled his own named Tohm, for some reason, so my friend took a silver sharpie and fixed it. That always rubbed me the wrong way. My case is different in that you can hardly see the sig, but screw it. There are worse things happening in life lol. With a flash it's fine. In normal light you can't even tell it's there. I see what you mean. Regardless, you got to meet the beautiful Scout Taylor-Compton. Yeah, I decided against going over it. That was a rash idea. I bought a frame light which should do the trick. othervoice1, The Joker and buck135 like this. I saw the signature fine in that first photo. The second photo was smaller and I couldn't tell. Either way, you made the right choice in not going over it. You have her signature. You know it's there. If anything the job now is preservation. I read somewhere that the wrong type of pen can evaporate over time if you display the poster in light or not behind UV glass. 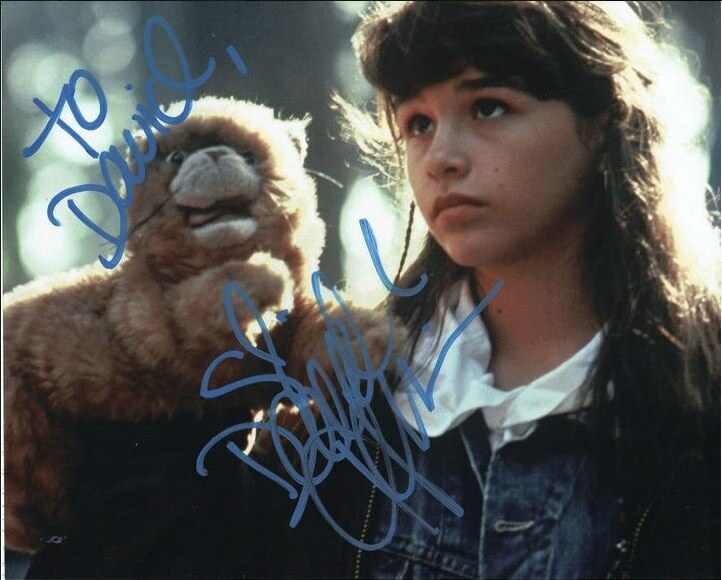 A few years ago Danielle Harris signed a pic with a blue pen that was vibrant blue. I expected the same with the sig in question. I was wrong. I realize this is the ultimate first world problem, I'm just bummed I can't see Scout's autograph in a shadow. Somehow, the planets will stay aligned. 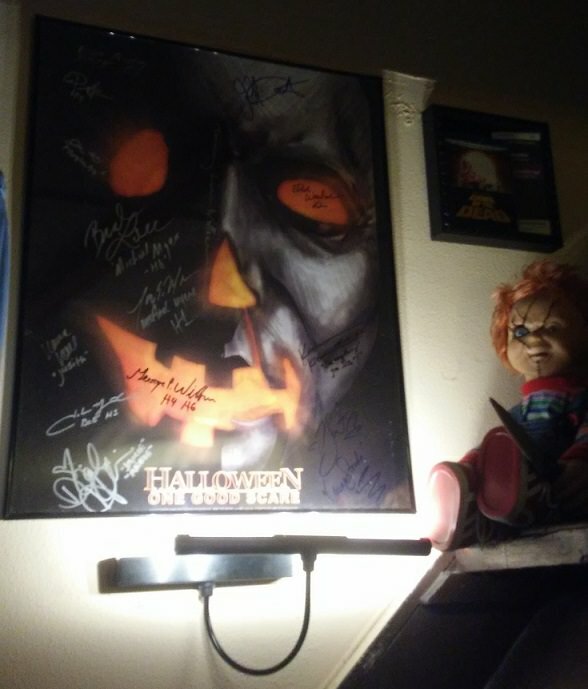 The big difference there is that Danielle Harris signature was done with a blue paint maker, not a blue Sharpie like the Scout autograph. Sharpie ink is transparent and doesn't show up well over dark coloured backgrounds, so if you have anything with a dark background to get signed always stick with silver as at least a silver Sharpie will show up over black. Only paint markers can you get away with any colour on black. While it'd be great if every signature was done with a paint marker, most people are still only using basic Sharpies where you're limited to silver on anything other than a light background. ImmortalSlasher, sinister, baggio and 3 others like this.